Open Saturday, April 6th for a Special Event! We are excited to be a part of the show season kick-off with Pig Trail H-D and Shine Tek Auto Spa at the 2nd annual Show & Shine. It's going to be a party with cool cars and hot bikes on Hudson Rd from 24th Street down to Woods Lane! If you've got something shiny to show off, make sure to get pre-registered! If you pre-register your bike, you are automatically entered to win a $250 Pig Trail H-D gift card. ShineTek also has a special offer for pre-registered cars! Make sure you get your space reserved for this event... a chance to win is just the icing on the cake! We will be open at 11am with a BBQ menu and ice-cold beer! From 1-4pm, our good friends JAB will be on stage in the Pig Pen to add some rockin' music to the party. Don't miss out! 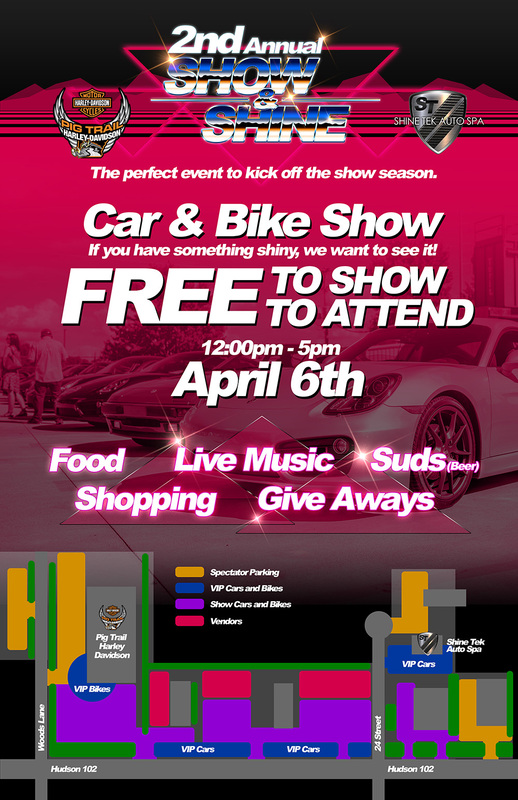 Come kick off the season with a full day of cool cars, hot bikes, outside vendors, live music & cold ber. It's going to be a big party! Let this special event whet your appetite for more grub, guaranteed gourmet good this summer. The Rockin' Pig Saloon Rogers food truck and beer garden will be open for the season at the end of April. Keep an eye on our Facebook page and this website for dates, times and more details!